Remember a few weeks ago when I listed all those different ideas for customizing the School Bus T-Shirt? 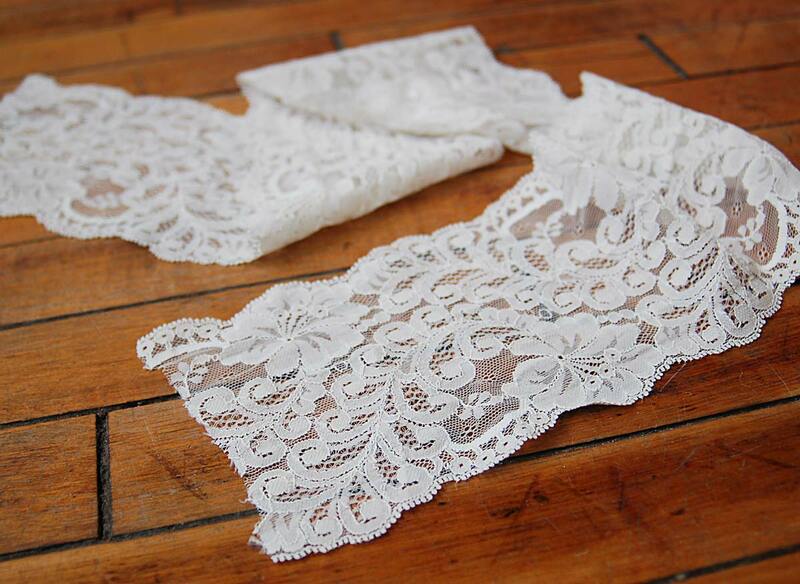 Here’s another one: the lace flutter sleeve. I’ve also included a tutorial so you can do it yourself. This is so easy and fast to make! I started with one yard of 5″ wide lace. 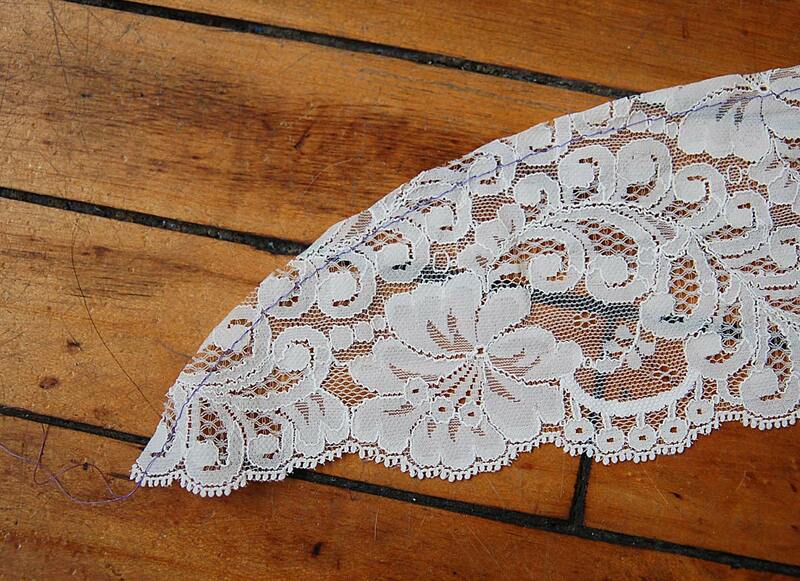 This lace wasn’t anything very expensive or fancy, although think it looks quite pretty. I don’t think I paid more than a few dollars for it at Pacific Trimming the other day. 1. 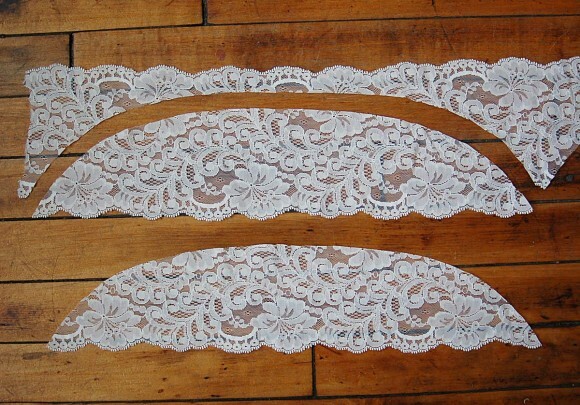 Cut the lace into two identical curved pieces like this. Each of my pieces was approximately 4-4 1/2″ inches wide and 18″ long. 2. 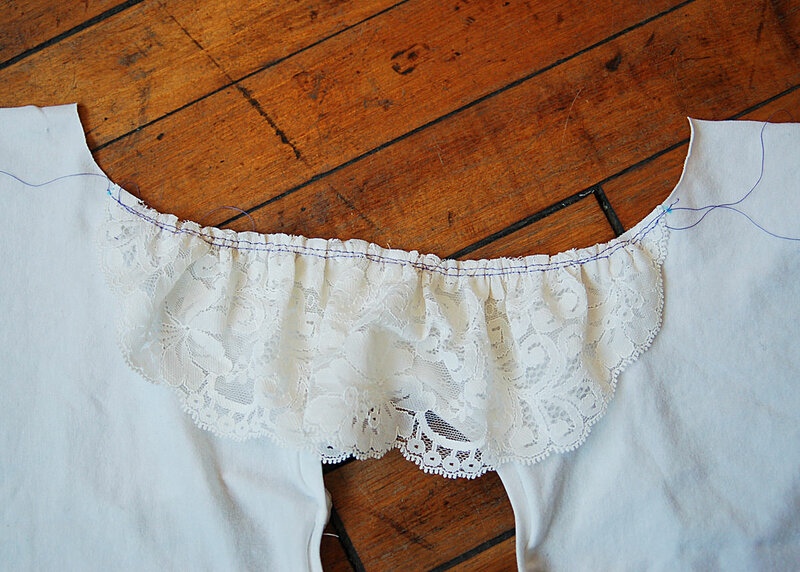 Add a row of basting stitches a scant 1/4″ from the curved cut edge on both lace pieces, leaving thread tails several inches long for pulling. 3. Find the center of each piece and mark it with a pin. 4. 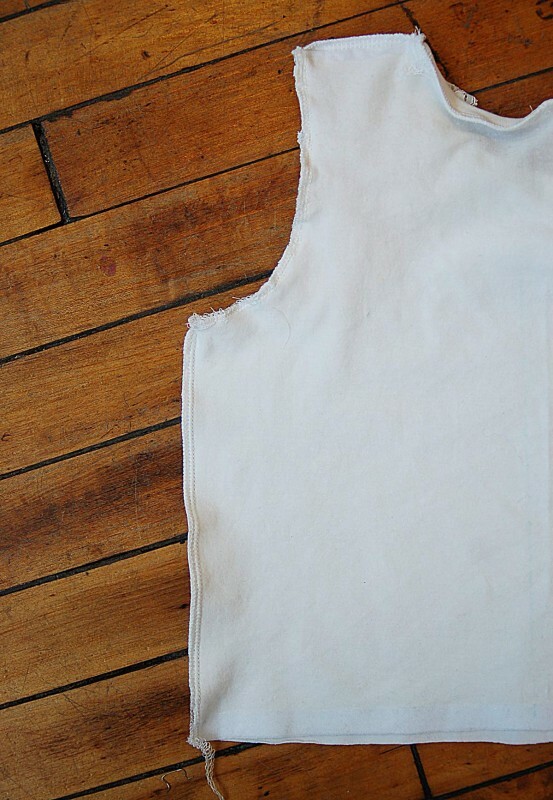 A ruffle sleeve doesn’t reach all the way around the armhole, so mark the armhole about 2″ from the side seams on both the front and back of the T-shirt. 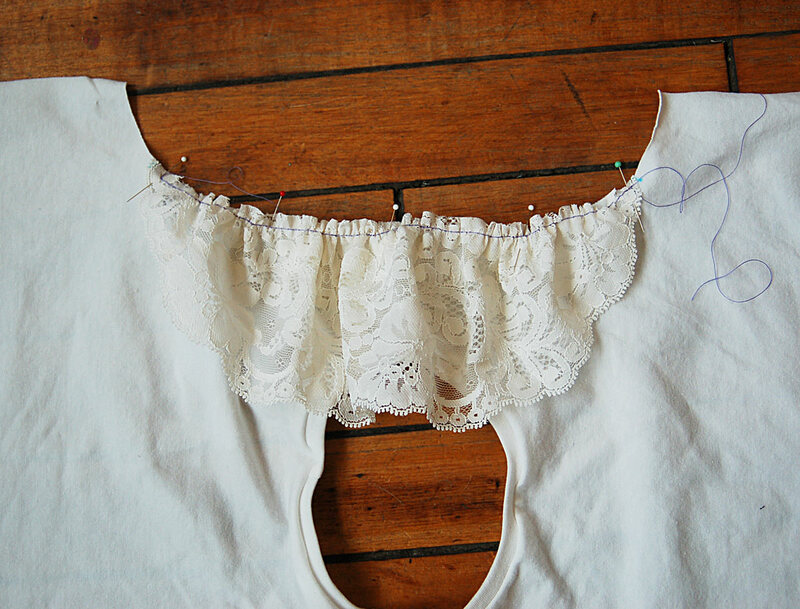 Pin the ends of the cut lace piece to the right side of the fabric at these marks and pin the center of the lace at the shoulder. Then pull up on the thread tails of the basting stitches to gather up the lace until its length matches the length of the armhole segment. Pin it into position. 6. 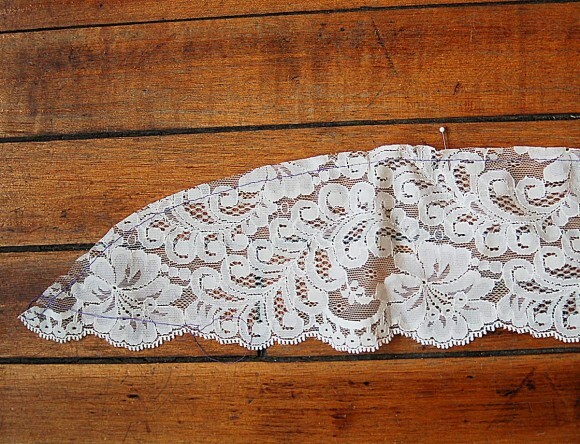 Once the lace is basted, stitch the side seams and finish the seam allowances as desired. 7. 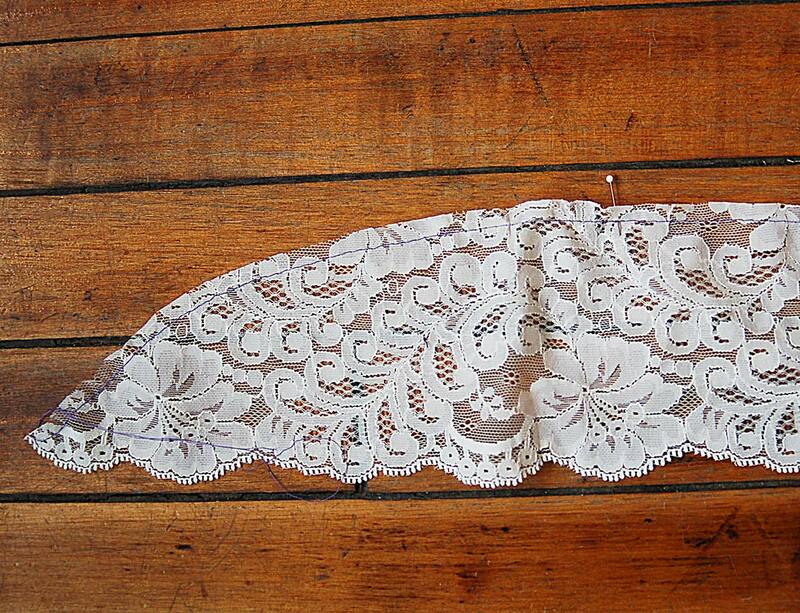 Then I folded and pressed the serged edge to the wrong side of the sleeve and gently pressed the lace ruffle away from the armhole. 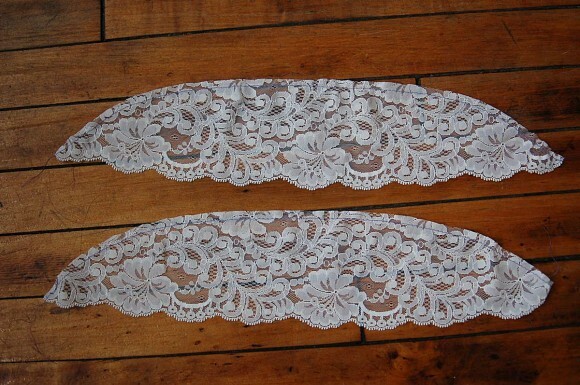 (If you’re using inexpensive polyester lace like I did, be sure to turn down the heat on your iron so you don’t melt it!) Edgestitch the armhole with a stretch stitch to finish it. And that’s all there is to it! Enjoy your lace flutter sleeves. And add a peplum while you’re at it for a really cute summer top! 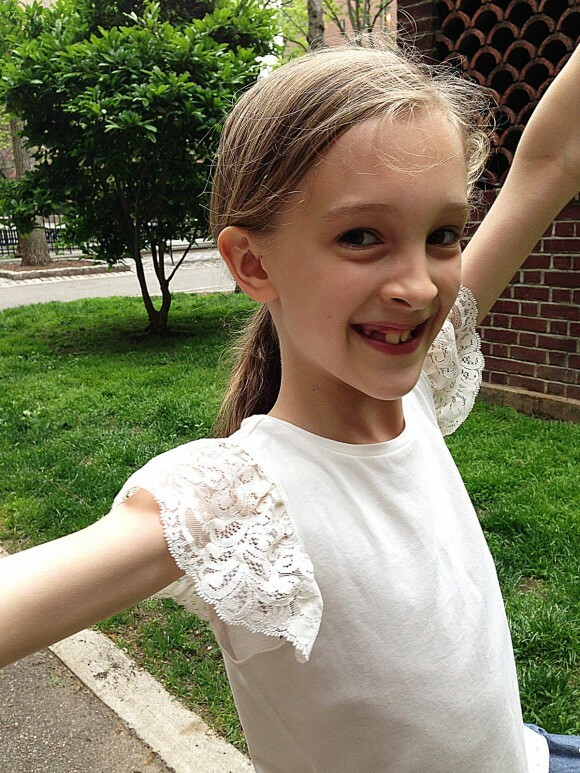 I recently took S to see the New York City Ballet, and she loved it. It might be time to start ballet classes! That’s so cute and easy. I love it! How funny! Last month I saw some beautiful lace at my local shop. She had it in white, beige, and black, and I said, “why, what beautiful sleeves those would make!” And in the back of my mind, I wondered, how would I do that? Now I know, and must choose what project will have lacy flutter sleeves. That’s lovely. 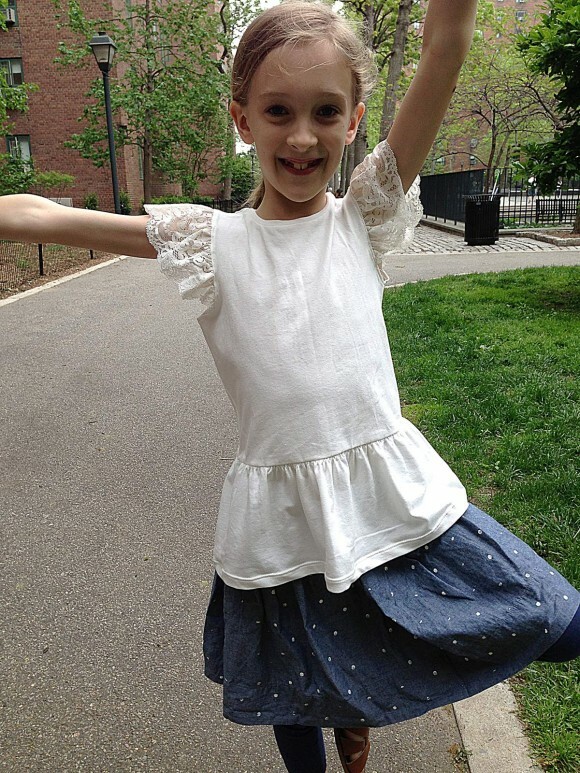 I was lying in bed last night thinking about lace sleeves in a top for my little girl, and now I can be more confident about doing it! I hadn’t looked at the original pattern yet and oh my goodness – I can’t even tell it’s the same shirt! Yay for variations and customizing! I LOVE it. This is definitely going to the top of my list. I really like the peplum too. I love it! Very cute!!!! Your daughter is beautiful by the way! Thanks so much! 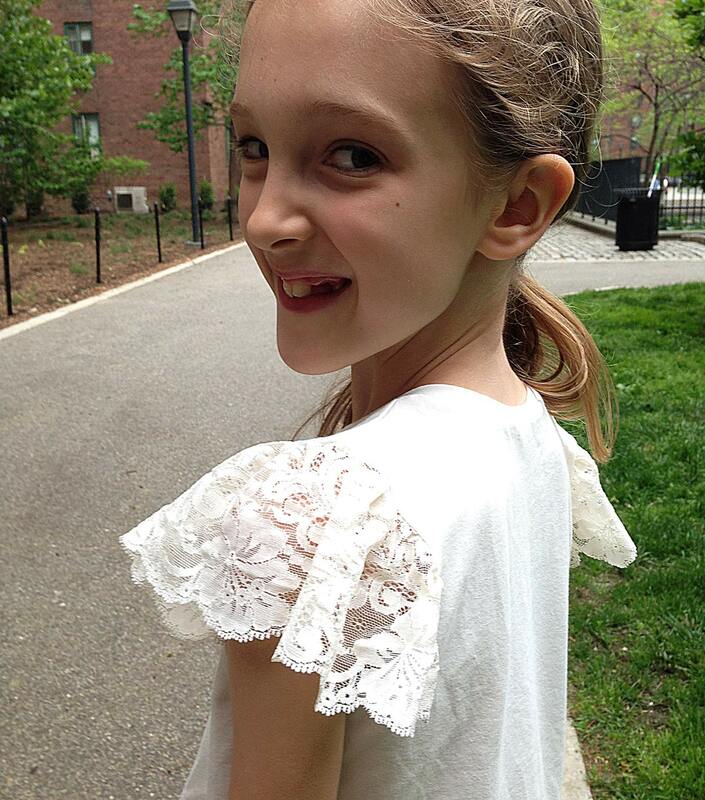 Hi there, can I do this with an adult’s dress that is Sleeveless? Fantastic,This is just what i was looking for, thanks for sharing.